City Strike Destro, more popularly known as Money Bags Destro, was an absolute bear to find. It marks the only modern figure for which I’ve paid a premium price. It hurt a bit (mainly because I’m a bit thrifty when it comes toy purchases) but I’m glad I picked up the figure. He’s a great little detailed version in the sort of outfit that’s not been seen before on the beryllium faced arms dealer. Having a truly battle ready Destro in the collection is great. I was initially concerned that the figure would be too close in appearance to the heavy weapons Iron Grenadier of the same period. I needn’t have worried, because Destro looks fabulous, and the tie-in to the uniforms of his personal army is a great unifying feature. The Money Bags name is a misnomer, although I suppose Money Briefcase Destro just doesn’t roll off the tongue. Regardless, the tiny stacks of cash are a pretty incredible detail. There’s even different denominations in various colors. Whether part of a dio, or just as an accessory, the case is one of the coolest accoutrements to come along in a while. The case isn’t the only impressive bit of gear, as his mini gun is uniquely designed and functional. It appears to be versatile enough to be held several different ways, quite a feat considering that sometimes these large weapons can prove unwieldy at this scale. Man, in a few stores in my neck of the woods, the distribution of this wave was so shoddy. I was so irritated by the fact he wasnt released over here. I wanted him sooo badly in 2011. Guess i’ll just have to check eBay. It’s funny how Arctic Destro clogged pegs forever, but this guy is so rare. It’s a better figure, and more practical. The money case is awesome and has initiated more than one adventure in this house. Though I did enjoy making him into a pretty sweet custom Red Torch, so he served his purpose. In the end, he’s just a cool toy that I had fun playing with. What more can one expect? 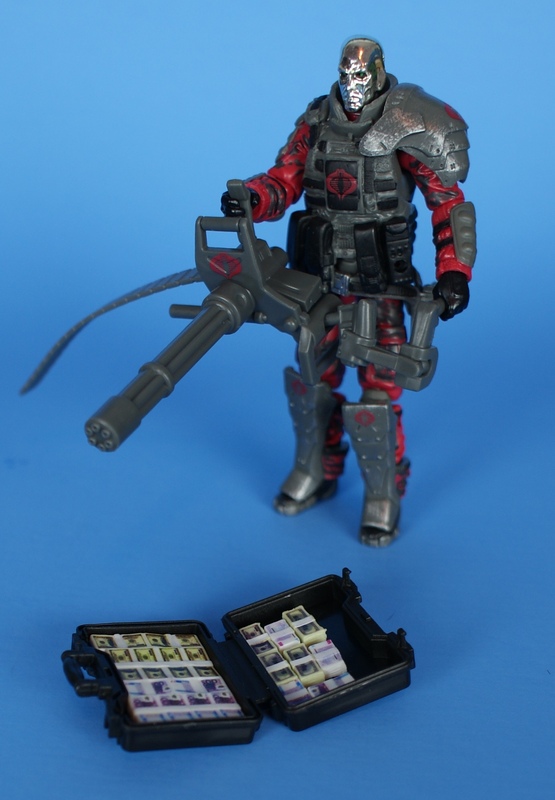 Okay, the briefcase full of cash is easily one of the best accessories of any toy line.